A three-mile long ridge trail along the Berkshires’ northeastern wall, Hoosac Range includes several dramatic vistas, including the one to the west at the trail’s Spruce Hill destination. A much shorter hike, 1.6 miles roundtrip, leads to Sunset Rock, which also has spectacular views to the west. 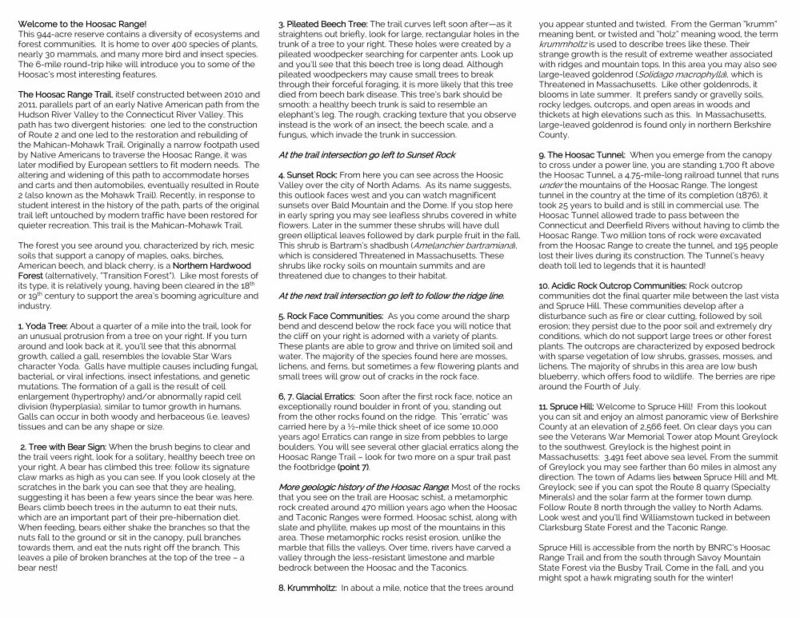 Special features: High elevation long views: prepare for the sublime! Cool rock cliffs formed by “glacial plucking” with trees twisted into fantastical forms by wind and ice. Blueberries at Sunset Rock and open ledges near Spruce Hill in summer. Awesome spring snowshoeing. Migratory raptors in fall, great viewing at Spruce Hill. Views over North Adams, Mount Greylock, and Florida State Forest. From North Adams: Take Route 2 east. Past the hairpin, on the top of the hill, the parking and trailhead will be on your right. From Pittsfield: Take Route 8 North, at the Cumberland Farms in North Adams, take a right onto 8A. Then take a right, heading east on Route 2. The trailhead parking is on the right at the top of the hill, immediately after the Wigwam Cabins. From the trailhead, hike three miles along a ridgeline to Spruce Hill, with its 180 degree views including Mount Greylock to the west. Hikers can return or descend to trailheads in Savoy Mountain State Forest by the Busby or continue on the Mahican Mohawk Trail. 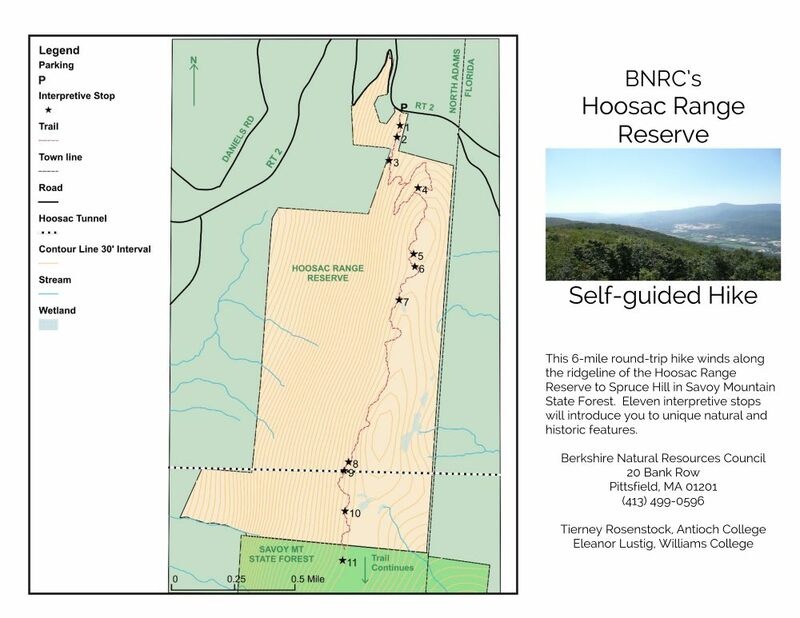 An out and back trip on the Hoosac Range Trail is about six miles and takes three to four hours. Far beneath the trail is the Hoosac Tunnel, a rail connection between Northern Berkshire and Boston that opened in 1876. The shorter inner-loop hike to Sunset Rock provides views to the west and north, overlooking North Adams. A round trip is 1.6 miles. 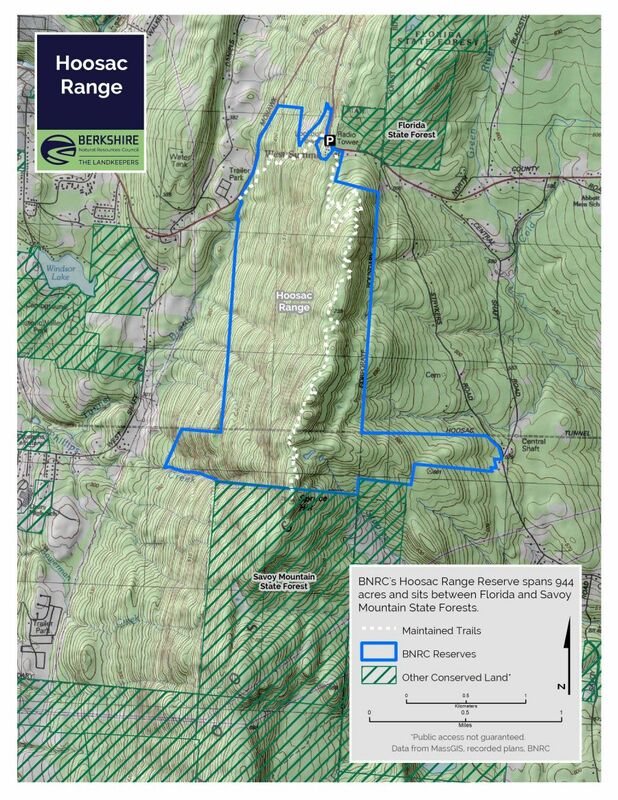 The 944 acres of the Hoosac Range property connect with the Massachusetts Department of Conservation and Recreation’s 11,118-acre Savoy Mountain State Forest. 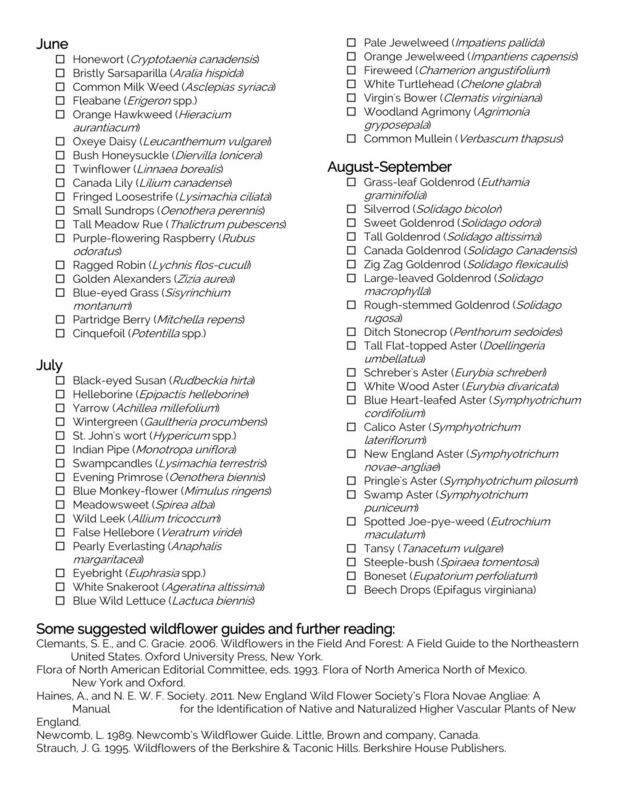 The sheer size of the protected area provides abundant habitat for a range of wildlife, from bears to beavers. Designed by Peter Jensen, the Hoosac Range trails take hikers past several outcroppings of the range’s characteristic Hoosac schist, a sedimentary rock that first began forming under the warm oceans of the Southern Hemisphere 550 million years ago, before travelling north via plate tectonics. The schist remained after the softer marble and limestone that surrounded it eroded under the constant melt-flow of glaciers. The Hoosac Range Trail is also part of the Mahican Mohawk Trail, envisioned as a 100-mile foot trail from the Hudson River, over the intervening mountain ranges, and back down to the Connecticut River. Heading east from here, the Mahican Mohawk Trail travels to Savoy Mountain State Forest, and then on to Mohawk Trail State Forest, where it traverses an original section of the historic native American path between the two great rivers. With unparalleled views from the top of Route 2, entrepreneurs once made this area a popular tourist stop, with a gift shop and cabins. A tall viewing tower meant visitors could climb up to survey New York, Vermont, Mount Greylock, the Taconics, and the surrounding state forests. The Wigwam Western Summit is now open and offers a coffee and gift shop and hot dog and soup bar. This ridge defines the eastern horizon in the north Berkshires, and securing it required patience, creativity, negotiating skills, and luck, in the form of landowners willing to sell. Following up on a tip in 2007 from a local citizen that Adelphia Cable was auctioning off its ridgeline parcel, BNRC stepped in and purchased those 193 acres. Over the next two years, five more owners, including the proprietors of the Wigwam, agreed to sell their land. The transactions secured an unbroken 2-mile long tract along the ridge. 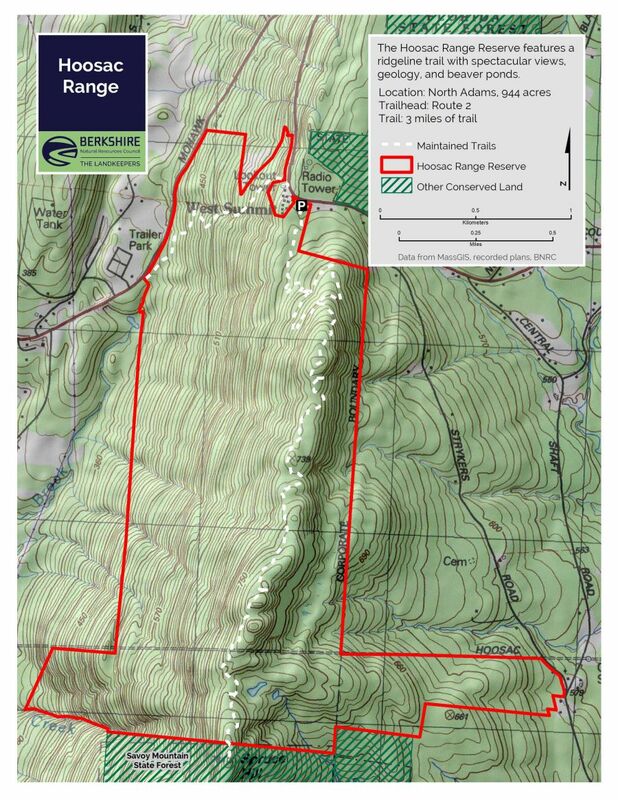 The Massachusetts Department of Conservation & Recreation, which owns the Savoy Mountain State Forest, purchased a conservation restriction over the entirety. The CR ensured a double layer of protection for the mountain, and helped to eliminate the red ink from BNRC’s $1.1 million spending spree. With the property secured, BNRC tackled the job of designing, funding, and building a trail along the spine of the ridge that would capture the most fascinating landscape features while appealing to experienced and novice hikers alike. At a cost of about $145,000, a skilled crew of trail builders working under the guidance of Peter Jensen & Associates, built the three-mile trail from the parking lot to Spruce Hill. This trail comprises a section of the proposed Mahican-Mohawk Trail, a 100-mile path replicating the Native American route. The trail takes hikers past a tree whose head-level burl recalls nothing so much as the “Star Wars” character Yoda. Another tree’s hollowed-out interior lets you look back at hikers following you. All along the ridge, many trees have been bent into twisted shapes by the constant stress of wind, ice and snow. 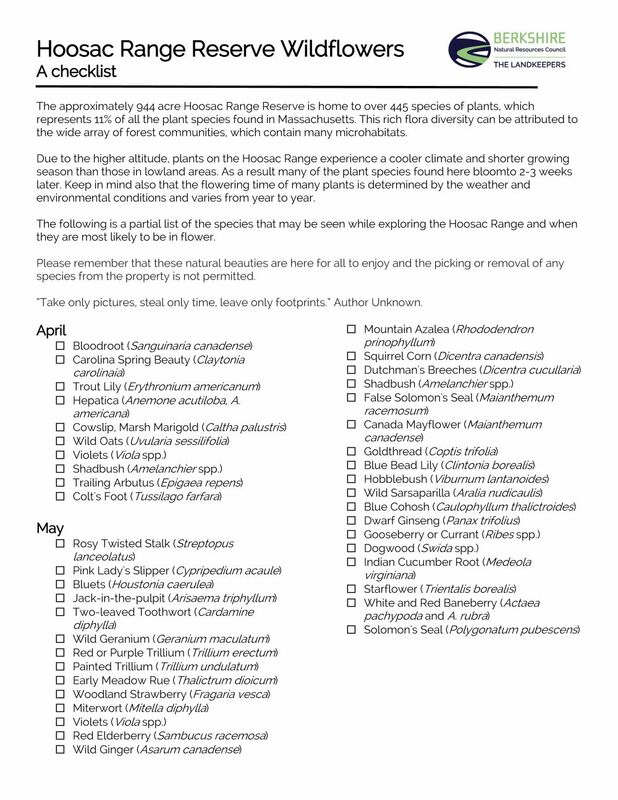 Wildlife include bears, bobcats and, especially at Spruce Hill, raptors in migration. A beech on the trail shows bear claw marks— evidence of climbing the tree for beech nuts. Along the trail are spring ephemerals, including hepatica. Hobblebush lines much of the trail. The trail passes moss- and lichen-covered cliffs where you traverse the rock face on carefully placed stone steps. Depending on the season, the cliffs may drip with water or ice.